According to my cousin-in-law, a Texas lad living in New York, America's Indian restaurant scene is pretty rubbish. Quite surprising for such a cosmopolitan city to have such a low incidence of quality Indian food when London is scattered with great food originating from around the Indian sub continent. So, when they came to visit this past weekend (2 young children in tow), it was left up to me to find a suitable location for us all to eat. Delhi Grill is a self styled "Indian canteen" (or dhaba), and serving a small (albeit focused) menu from the tandoor and from the pot, and seemed a good place to take my family. After a small issue with numbers (my fault due to more people turning up), we managed to get all 9 of us round a table and started to tuck in. We managed to pretty much order everything. 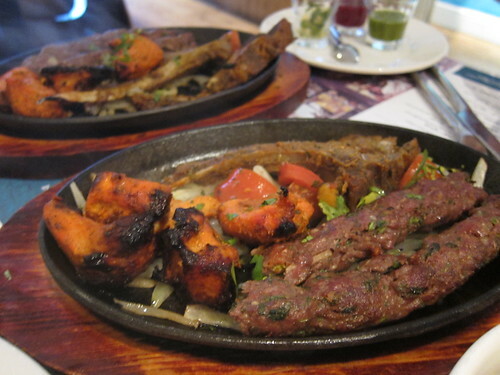 An assortment of grilled meats from the tandoor were delicately spiced and rather delicious. The sheekh kebabs were extremely tender, falling apart but packed with flavour and the lamb chops had a similar melt-in-the-mouth consistency. All meats, I am told, are marinated overnight in a traditional recipe and are packed with spice. The assortment of chutneys are well received, with the beetroot based chutney especially popular with the three year old (we told her it was special ketchup, she devoured it). From the pot, we ordered all the meat curries and a selection of the veggies off the specials menu. Out of all the food we ordered, I think I was probably least impressed with the curries. They appeared very heavy on sauce and we were often left fishing around to see if there was any meat left towards the bottom of the serving dish. Personally, I like my curries a little on the drier side. The veggie dishes were rather good though. I believe that it was during the Indian harvest festival (baisakhi) so the majority of the specials were vegetarian dishes and bloody great they were too. 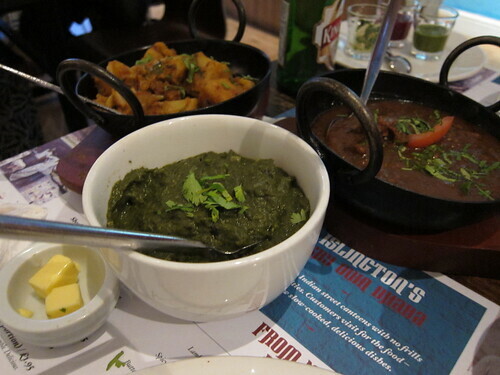 Saag (spinach) came with two lumps of butter to really make it rich and velvety, and the aubergine (baingan) was smoky like a Lebanese babaganoush, but rich in Indian spices. 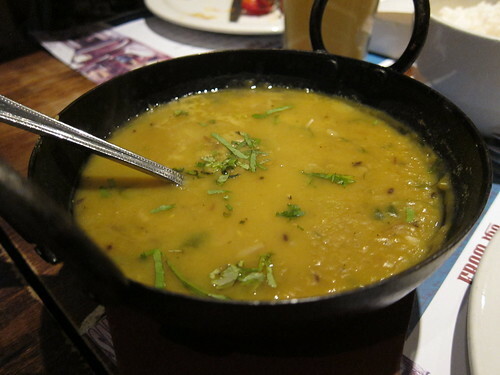 Best of all was the tarka dhal which is made from yellow lentils, packed with garlic, coriander and cumin. It has always been a personal favourite and between my dad and I, we mopped this all up with the wonderful naan bread. I can certainly see what the fuss is about at Delhi Grill. 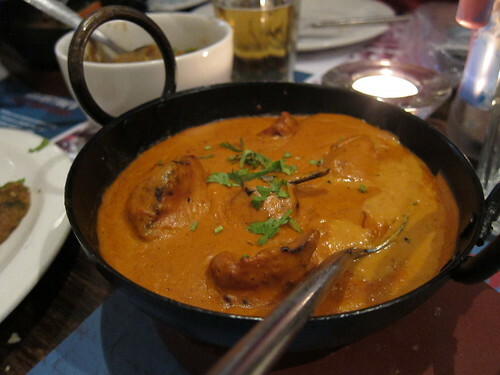 The food is great and is definitely a step above your standard curry house fare. I liked that it concentrates on a few good dishes and the rotating specials board should not be ignored. They coped admirably with the demands of our rather demanding table and costing just under £100 for a table of 7 adults (and two children), I think it smacks of exceedingly good value. 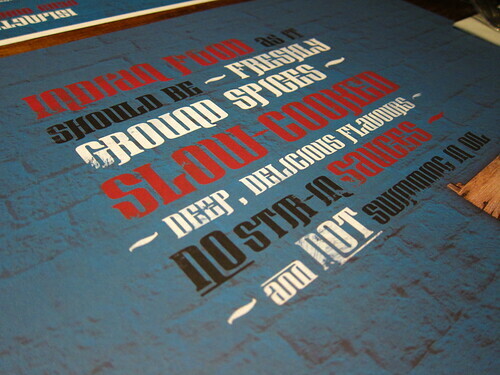 I've heard that their veg dishes are really good - those seekh kebabs look delicious. I do need to go back and try them again, as the first time I went I was rather disappointed, but I had just spent 2 months travelling around northern India viewing hotels and eating in their restaurants. So my taste buds were demanding more than they could give me. Now they have returned, so I should give them another chance. The hype surrounding Delhi Grill has died down a lot, as every time I walk past the place, it is always pretty empty. @ Lizzie - The veg dishes were lovely and worth a visit alone. @ Mzungu - It's worth noting that this place isn't "upper end" but the food is good and I thought the spicing was spot on. I've been a few times and the food has always been pretty good. Their dahl and grilled meats are very good, the paneer and chickpeas even better. What I have noticed is that the specials are often noticably better than the standard mains, particularly when it comes to meat. I had a slow cooked (for 24 hrs) lamb dish that was very good indeed last time I went. Sounds good Eu Wen. Being a veggie AND from Delhi myself, I shall stress test this place tomorrow!